The Burt's Bees Workshop today started off with a Yogataal session by Candi Soo Fitness. We were not expecting a yoga so soon into the workshop! but it was a great way to start the blood pumping and fresh breath of air beside the beautiful pool at Royale Bintang Hotel, Mutiara Damansara. There's more, stay tune! the participants were spoiled for good! check the goodie bag out! I am so happy about the goodie bag that I have jumped to talking about it now before I talked about the workshop! This has got to be the best workshop that I paid for! There was a tea session (drinks and finger food) and a lunch buffet at the Royale Bintang restaurant (lobby) and Bobbi Brown makeovers for anyone interested! The goodie bag if a bagful of Burt's Bee goodness ALL ACTUAL SIZE PRODUCTS and Bobbi Brown's whitening skincare trial kit and makeover voucher. Tell me this ain't real! *pinch* It's all really worth RM200! I am screaming as I write. I also won a hand salve and lip shimmer for a question! Thanks to my environmental friendly organic unbleached cotton bag (I have been carrying it to store my shopping stuffs), I won a Burt's Bee prize! Inside the brown paper bag is a lip shimmer worth rm31 and a hand salve. I am so excited when I reach home I showered with the Body Wash, put on the hand salve and beeswax lipbalm which is so amazingly nice & minty. Can't believe Burt's Bee is finally in Malaysia! To sum it up for now as my camera passed out on me due to me forgetting to feed it food for a few days (mygawd I better don't own any pets). The workshop was a great fun! especially since I met so many of my readers there. It was well organized, not boring thanks to Jo the speaker who introduced Burt's Bees and it's goodness to us via a video presentation, easy to understand introduction to the natural products and world of Burt's Bees, a prize Q&A session and a fun DIY skincare mask session for everyone to participate in. Bobbi Brown is one of the sponsors who participated in this workshop. Their training manager Carina, introduces Bobbi Brown's latest campaign "Pretty Powerful" whereby Bobbi Brown had a contest to seek out 15 people who showed Bobbi Brown how they became from feeling pretty to pretty powerful with Bobbi Brown cosmetics. I LOVE LOVE THIS VIDEO I love the girls and their makeovers. They don't need a full/dramatic makeover to look pretty as they're already pretty beautiful (and became more beautiful with cosmetics). After this video, a makeup demo was done on Chingy (err spelling unknown) PR for Burt's Bees. We could see how a simple cream blusher gave her a younger and fresh look (like a teenage girl in love). Everyone can have a mini makeover after the workshop ended (but the Q was too long, so I didn't stay for it). Before the workshop come to and end, lucky draws prizes were given! almost everyone went home with a prize! Candi Soo sponsored 5 fitness prizes, Bobbi Brown sponsored 5 hampers worth RM350 and Burt's Bee also sponsored 5 lucky draw prizes (apart from Q&A prizes). Everyone walked home a winner even if they didn't win anything coz the GOODIE BAG made everyone feel like a winner! thx to John for these pictures of us at Burt's Bee Workshop! best workshop that I have attended! 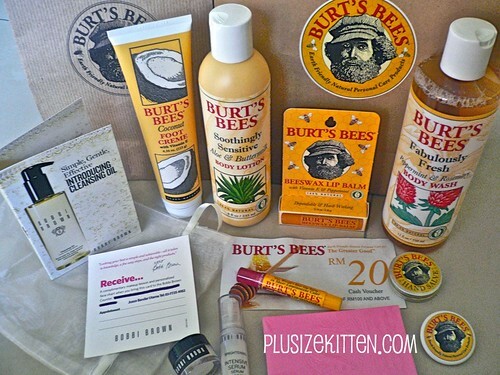 Thank you Burt's Bees for such a wonderful workshop and generous in the prizes and goodie bag! We ate light refreshments in the morning after Yogataal with cool honey lemon drinks and then had a HOTEL LUNCH BUFFET at Royale Bintang Hotel's cafe. For the amount I paid (RM30) I regretted not bringing my mom & sister to experience all the goodness and Burt's Bees! 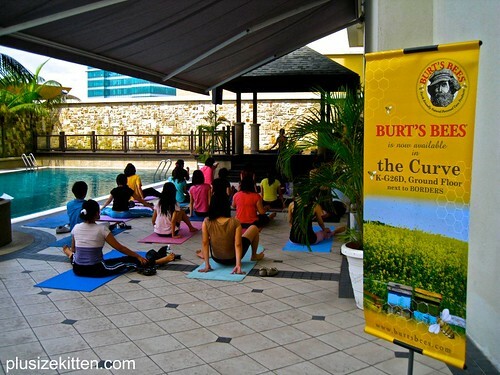 *Burt's Bees Malaysia Retail Store opened at The Curve, Mutiara on 18th April 2010, and at next one will be at The Gardens, Mid Valley City on 1st June 2010. 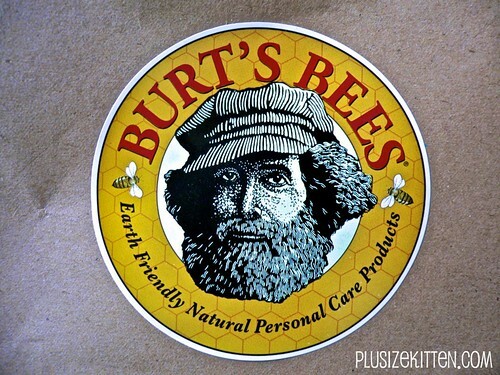 Join their facebook fan page by searching for Burt's Bees Malaysia. pls share after u use the shower gel & the lotion . wahhaa... jaw drop saw the freebies. ML: yes yes I think i'm goin to have a field day trying out their products! I still can't believe we got all that!! OMGGGG! The goodie bag is soooo superb! Actual size lagi. Have to say the best goodie bag that i've ever seen so far. OMG! i miss this workshop and the goodies. OMG, I totally totally dig your goodie bag! Fabulous! Irene: I know!!! warghh until today i still think it's a dream!!! Reena: yahlah!! T__T so sob... i wish everyone can go n be happy too!!! so bahagia the goodie bag..
Wow...so fast blog di! Really superwoman! Am still overwhelmed with my 3 days bday celebration and all the goodies i get!! I duno where to start and wat to write actually. Am dumbstruck! Show in FB first!!!!!! no lah.. i dun have much pictures so... very easy blog haha..